Born: 2nd January 1897, Chiswick, London. Died: 18th February 1915; age 18; Killed by a sniper whilst trying to get water for a wounded comrade in the Battle of Ypres. Enlistment Location: Ipswich; 21st July 1914. Rank: Private; Service Number: 8998. 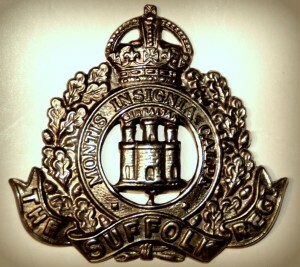 Relatives Notified & Address: Son of Mr W.R. Beecroft, of 55, Rope Walk, Ipswich. 1901 District Western Hospital, Fulham, London. George was 4 years old, and a Patient at the hospital. His family were living at 165, Stephendale Road, Fulham, London. 1911 22, Bond Street, Ipswich. George was 14 years old, and assisting his father in business. He was living with his parents & brothers. William Ricahrd Beecroft, 46, a Firewood Dealer, born Hastings, East Sussex. Ellen Eliza Beecroft (nee Cracknell), 39, born Bradfield, Essex. Arthur Thomas Beecroft, 16, assisting father in business, born Hammersmith, London. William Richard Beecroft, 12, born Chiswick, London. Frederick Beecroft, 10, born Fulham, London. Edward Beecroft, 7, born St. Helen’s, Ipswich. Alfred Beecroft, 2, born St. Helen’s, Ipswich. George attended Clifford Road School, Ipswich. 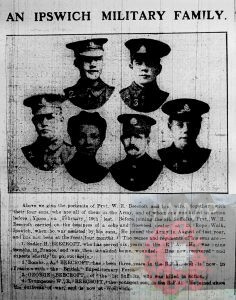 Soldiers’ Effects to William R. Beecroft – father. George is remembered on St. Michael’s Church War Memorial Ipswich. Sadler H. Beecroft, who has served six years in the R.F.A. He was nine months in France, and was then invalided home, wounded. Has now recovered and expects shortly to go out again. Bombr. A. Beecroft has been three years in the R.F.A., and is now in France with the British Expeditionary Force. George Beecroft, of the 1st Suffolks, who was killed in action. 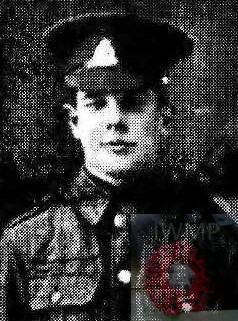 Trumpeter W.R. Beecroft, the youngest son, in the R.F.A. He joined since the outbreak-of-war, and is now at Woolwich.